This map starts with a reminder that all treatment occurs in context, a starting point that will matter to your patient. To read a discussion of this issue, click here: [Section 1]Next, in Section 2, we consider the nature of the patient’s issues, whether fear, anxiety or panic.At this point, it is important both to gather information and to work on your relationship with the patient. Anxious people can be difficult to deal with – they generally have difficulty dealing with themselves – and you need to work cooperatively throughout treatment. The flow chart shows work on the treatment alliance [Section 4] as beginning early and continuing throughout, and parallel to, other aspects of treatment.Information gathering [Section 3] is placed early on the flow chart, but it will continue throughout therapy, and is part of alliance-building as well. There is no text to accompany the advice to “do both” at this time. 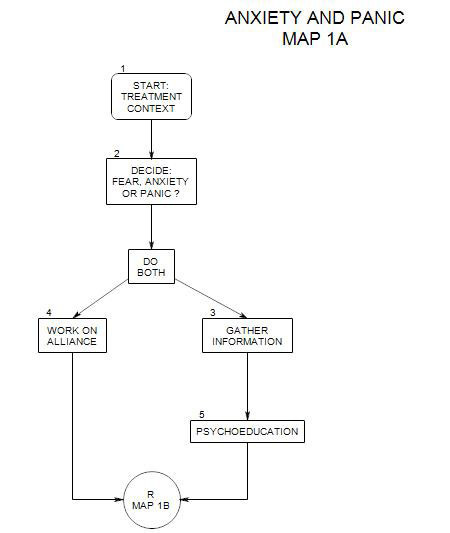 Psychoeducation [Section 5] is also shown early on the treatment process; but providing information to a patient could happen at any time in therapy.Next you are referred on to Map 1B, where the search for the origins of the patient’s anxiety will begin.